Just 30 miles from Cancun International Airport you will reach the gated enclave of Mayakoba. Mayakoba is a master-planned resort and residential development which was designed to follow the contours of the area’s existing geography. The developer purchased the land in the 1980s and 90s, recognizing that the clearing of mangrove trees in Cancun had contributed to the loss of the barrier reef there. Early in the 1990s, before any building occurred, the developer sent a group of biologists to live on the land and determine where building would be safe, and where conservation was necessary. Today Mayakoba remains true to the goal of living in harmony with its ecosystem. Within its bounds, meandering waterways lined with mangrove trees are interspersed with jungle, dunes, and cenotes (naturally occurring sinkholes), bordered by pristine beaches with intact reefs. Monkeys, turtles, pelicans and flamingos, and many other species make their home here, along with a select few who own residences here, and the rest of us who are lucky enough to visit. 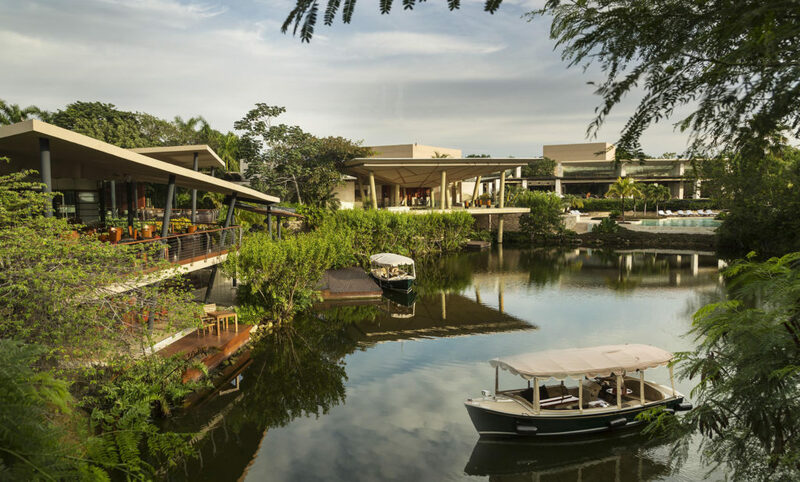 Fairmont Mayakoba, an AAA 5 diamond resort features a selection of more traditional, but still well-appointed, guestrooms and suites typical of the high-end hotel chain. I especially enjoyed El Puerto, celebrity chef Richard Sandoval’s Latin-Asian concept restaurant. 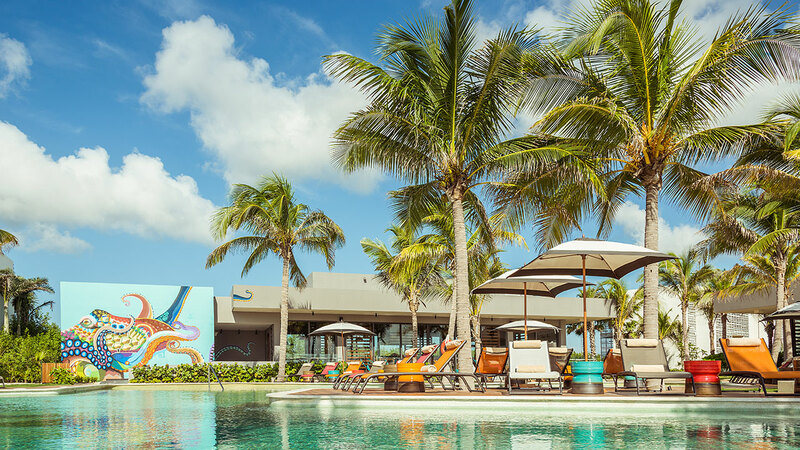 Andaz Mayakoba is the newest resort at Mayakoba, opening this past year. Traditional hotel rooms and suites are done in a minimalist aesthetic loyal to the surroundings, and the resort has a sophisticated style with local art and flavor typical of the brand’s lifestyle philosophy. An example are the colorful murals seen throughout the resort, the result of a collaboration with the local graffiti artist Senkoe. Banyan Tree Mayakoba’s 122 stand-alone villas and residences are decorated with a combination of Mayan and Asian aesthetic. Each unit features a private outdoor pool and living space. The renowned spa features traditional Asian healing techniques and local ingredients such as Melipona honey gathered from Mexican bees. Saffron, the resort’s signature Thai restaurant, is excellent. 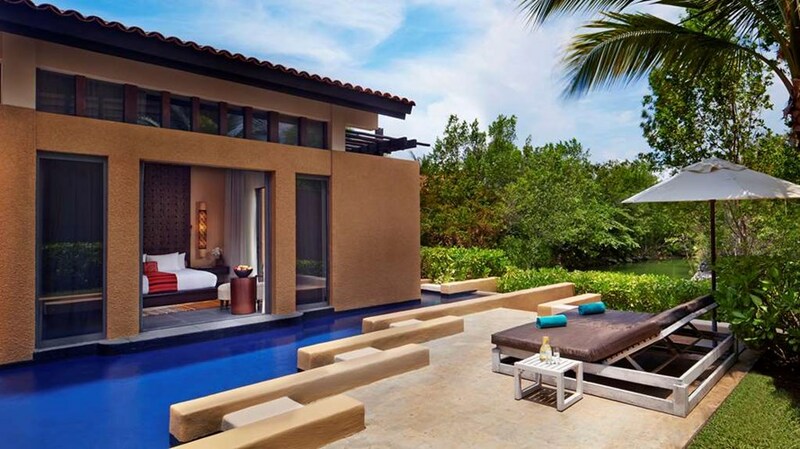 Rosewood Mayakoba, an AAA 5 diamond resort, is perennially named one of the best resorts in the world. Rosewood is home to 129 elegantly designed stand-alone suites that each have their own heated plunge pool; the smallest of these measures in at 800 square feet. A series of lagoons connect the four resorts, and resort guests can travel between them on covered electric Duffy boats known as “lanchas”. Guests can also travel by complimentary house car from one resort to another, or walk along the beach. Walkways meander through the property, and golf carts are available to transport guests with a phone call between the beach, rooms, and restaurants within their resorts. Bicycles are also available to guests to use during their stay. The development is also home to El Camaleón, an excellent 18-hole Greg Norman-designed course that is home to Mexico’s only PGA Tour event – the OHL Classic at Mayakoba. Whatever your personality, Mayakoba likely has a resort that will fit. Contact Andrew Butler Travel at 832-472-9574 or andrewbutlertravel@gmail.com for matchmaking advice as well as to ensure VIP treatment, exclusive amenities and credits, and possible upgrades.